History : AgroMax was established in 1995. Its founder started the company after having worked in the international poultry business for more than 20 years. Initially the company limited its activities to the production and marketing of fogging systems for poultry houses. Later it expanded the product range with other poultry housing equipment including feeders and drinkers to offer the complete range of products needed for the efficient keeping of egg and meat type poultry. Business activities now extends to more than 45 countries worldwide. Being based in the Netherlands, the country famous for its efficient poultry industry, AgroMax quickly learned how to make use of the modern technology in poultry production as well as in doing business. 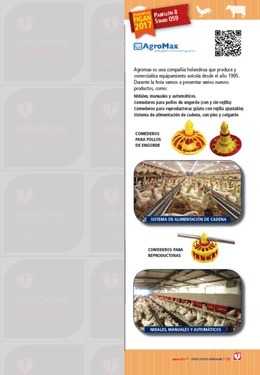 In 2005 the company successfully launched the idea to market poultry equipment through internet. The success became known outside the Netherlands and initiated the plan to make the internet site accessible for international customers as well. Mid 2008 the AgroMax became the first and only international company offering the full range of poultry equipment through internet. Mission : AgroMax wants to supply poultry farmers worldwide with high quality poultry equipment at the best price in an easy, efficient, economical way. Step 1: When you are interested to acquire or buy a product form AgroMax, you can choose the number of the unit of a single product (like a fan or heater) and if you need a complete system like feeding or drinking complete system you fill the offer form and send to us by email or fax. Step 2 : AgroMax can also be contacted by phone, fax or email to receive assistance in finding out all the technical specification of the products needed to complete the order along with help to complete the order formalities. Step 3 : After an agreement on all technical aspects has been reached, AgroMax will send the quotation for the purchase. With a possible discount percentage is offered depending the size and composition of the order. Step 4 : Following an agreement on the final ex work price, payment conditions and delivery time, the transport arrangement can be finalised and the deal can be concluded. Many poultry integration have the problem of birds mortality during the times of birds catching and in the processing plant during waiting in the trucks and in the holding area. Un anuncio siempre queda bien y recuerda al sector la propuesta de valor de AGROMAX BV.